Summer has come and gone, which means it’s time for college students to move back into the dorms. For a majority of college students, having enough storage space often becomes an issue. As most of you know, dorms are small with little to no storage space. Seriously, where are you supposed to put all your things in that cramped dorm room? Especially if you add a roommate or two, you find yourself suddenly searching for extra storage and space. Moving to and from school can be a crazy time for students. There’s no reason to add extra stress before school starts. College student, meet storage unit! Renting a storage unit is an easy and great option when you’re living in the dorms. A self-storage unit can help reduce clutter and be a convenient and cost-effective storage option. At Bargain Storage, our units can provide college students a safe place to keep their possessions while they’re in school. 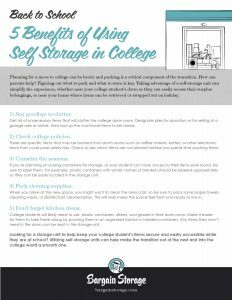 Here are some ways you can make your college experience better with a self-storage unit. Store clothes seasonally. This will help you gain space in your dorm closet. Move items to storage that you don’t use as much. For example, sports equipment. Store your snowboard, ski’s and bikes so you’ll always be prepared for your favorite outdoor activity. Easier move-in and move-out. Find a self-storage unit near your dorm or campus so it’s easier to get your personal belongings moved into your dorm when you come back at the start of the next year. Don’t sell your car! Rent a storage unit. For some college students, parking is scarce and hard to come by. Forget the hassle of searching for a parking spot of expensive parking garages. Self-storage facilities offer vehicle storage at a much more affordable price. Use the buddy system. If you don’t have enough stuff to fill an entire storage unit, you could consider sharing with a friend to help split the cost. College can be a little hectic at times but it’s a great experience. So save yourself some unneeded stress and enjoy some extra space by using a self-storage unit in college. Trust me, your dorm and closet will thank us later. If you’re looking for a self-storage unit close your campus, check out BargainStorage.com.